Imagine a building that looks as if it was put there just to pay homage to one of Ireland’s most spectacular landscapes? 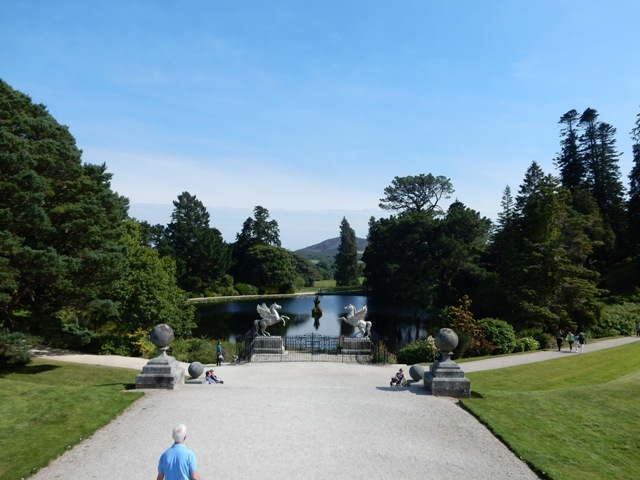 Five star Powerscourt Hotel on the edge of ancient deer forests in a historic estate sprawling over 1,000 acres in the” Garden of Ireland” is like that. It draws your eyes from all angles to the breadth and beauty of a landscape dominated by the Great Sugar Loaf Mountain across the valley. This hotel, placed along the Strip in Las Vegas might well resemble a showy wedding cake reinvention of classical Rome rubbing shoulders with Palladian extravagance. Here amid the tranquillity of Co Wicklow, only half an hour’s drive from Dublin but still feeling a million miles away, the seven story luxury hotel design works surprisingly well. 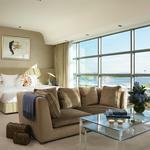 Making a grand statement, given the location, it slides seamlessly into one of the country’s best loved beauty spots. The hotel’s curves have given almost all rooms and suites a superb view of the mountains, framed by birch, oak and coniferous woodland. 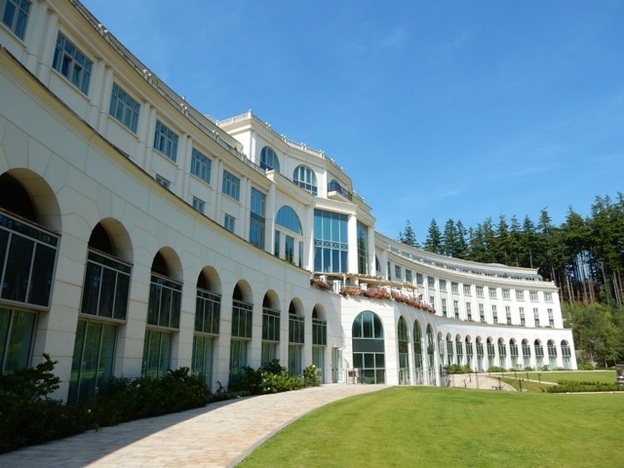 Back in 2007 at the height of a soon to cease roaring Celtic Tiger Era, Powerscourt Hotel Resort and Spa personified wealthy modern Ireland. Some sneered at its Palladian aspirations, considering the hotel ostentatious and too over the top for its surroundings. In hindsight comparing a new building like this one that had to incorporate all the demands of 5 star accommodation with nearby eighteenth century mansion Powerscourt House, gutted and left derelict for decades after a disastrous fire in the mid 1970’s was unfair. 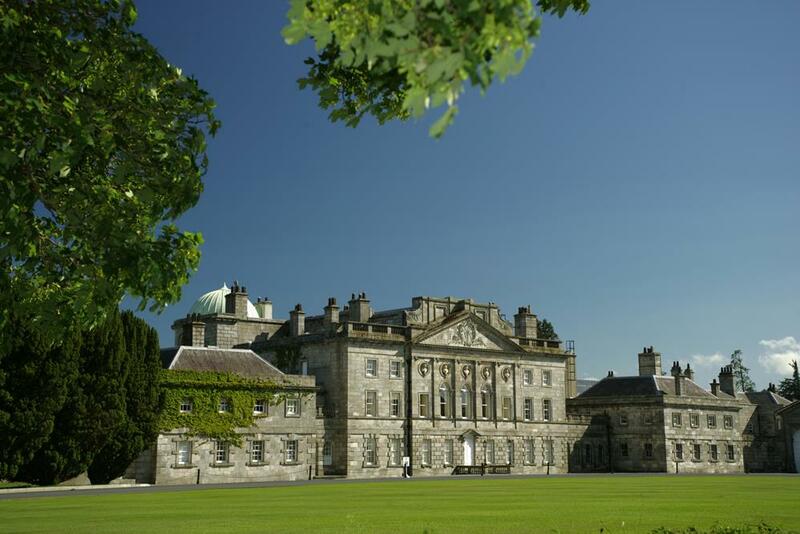 The historic Powerscourt House a few minute’s walk down the tree lined avenue from Powerscourt Hotel was beautifully restored externally. 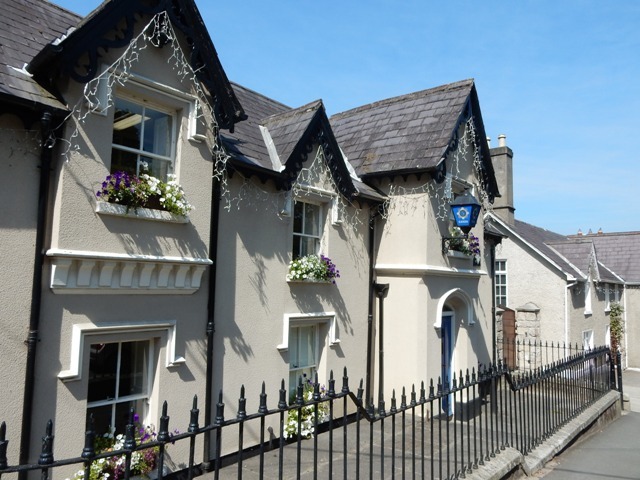 Rather than refurbish the fire damaged period interior cornices and sweeping staircases were swept from the drawing board while the space instead gave way to familiar tourist haunts like a collection of craft, souvenir, fashion and home ware shops and a country fare Avoca restaurant. Watching hordes of tourists browse and take their coffee and home baked cake out on to the terrace on a beautifully sunny afternoon I thought “ what a better idea than boring everyone for hours with dusty portraits and objects d’art younger generations have no connection with”. Maurice Leahy who has worked for many years at Powerscourt Gardens told me “they come from everywhere, even Easter Island and Samoa enjoying the gardens. 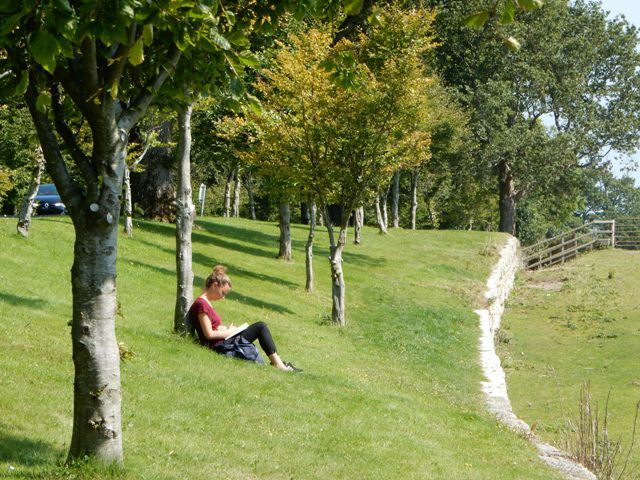 For some it is the Japanese Garden while others rave about dolphin pond, the walled gardens with their traditional herbaceous borders or Triton Lake and Tower Valley”. The gardens were recently named no 3 in the world’s top by National Geographic, behind Versailles and London’s Kew gardens. More than 246,000 people visit annually. Back at Powerscourt Hotel, entering the enormous lobby you easily experience a wow moment watching the conical shape of the Sugar Loaf mountain glint in the evening light beyond the vast curved glass floor to ceiling window. The Sugar Loaf lounge on the entry upper floor was crowded with residents and visitors who had dropped in for a relaxed drink or a late afternoon tea, some all dressed up, others in shorts and flip flops. 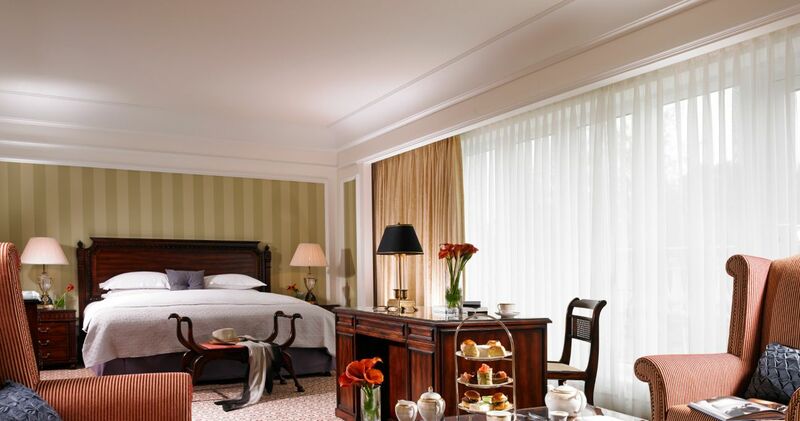 As a Ritz Carlton formerly, Powerscourt Hotel had an out of bounds for non residents aura about it. Rebranded now as a stand- alone resort its leisure centre, two championship golf courses and other amenities are enjoyed by residents and non residents alike. Visit McGills, traditional Irish wood panelled pub ‘of an evening’ and you can enjoy a music session or chat with foreigners and locals who have dropped by for a pint of beer and some excellent pub food. That also set this hotel apart as a cosier and more accessible luxury hotel than other comparable 5 star properties, I felt.. The hotel’s 200 rooms includes over 90 suites including some boasting a long expansive outside terrace with sun loungers. We were on the ground floor and close to the fire exit which pleased my husband. The swimming pool with its Swarovski light fittings (and no natural light) plus 20 relaxing treatment room spa was only steps away. Our elegant suite – all five star furnishings, including sumptuous bed and a touchpad which controlled the lights, air-co and do not disturb and other notifications – had the obligatory gorgeous view of the Sugar Loaf but being ground floor the windows were sealed ones. It boasted sufficient cupboards, wardrobes and other storage space for the luggage of several of members of the Kardashin clan at once! I could not get enough of watching Monty Python and the soaps on the fabulous TV incorporated into my bathroom mirror while I was washing my teeth and doing my make up before dinner. Truth told I spent a huge amount of time on personal hygiene here. We ate in McGills on our first night – Dexter beef burger for him and a Mexican chicken burger for myself and both were excellent at € 18 each. A bottle of Portuguese very average red wine was nearly as expensive as both main courses at €32. The next night we dined in style at the elegant Sika Restaurant . 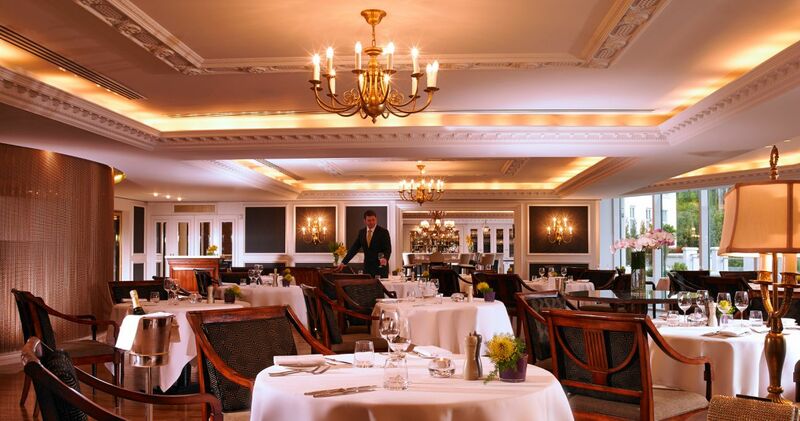 A portly man from Northern Ireland (many guests had travelled south from NI enjoying this comparable Four Seasons and Peninsula Hotels experience for a fraction of the sterling rates) was heard remarking that the portions were small. But we were well satisfied. Our starters included pan fried scallops with a pigs head croquette on creamed leaks and pan fried quail with a wild garlic and shitake mushroom. Wicklow lamb cooked in various ways was delicious and his sirloin of Hereford prime beef and baby spinach was sublime. He finished with a good local Irish cheese selection while I indulged in Rhubarb millefeuille with ginger and caramel ice cream. The suppliers of ingredients were listed on the menu which cost €50 for 2 courses and €60 for two. 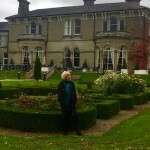 Our stay at the Powerscourt Hotel was a lovely indulgent experience enhanced by surroundings close (half an hour’s walk) to the nostalgic village of Enniskerry with Ireland’s prettiest police station , awesome wilderness drives over the Sally Gap and Ireland’s highest village of Roundwood. 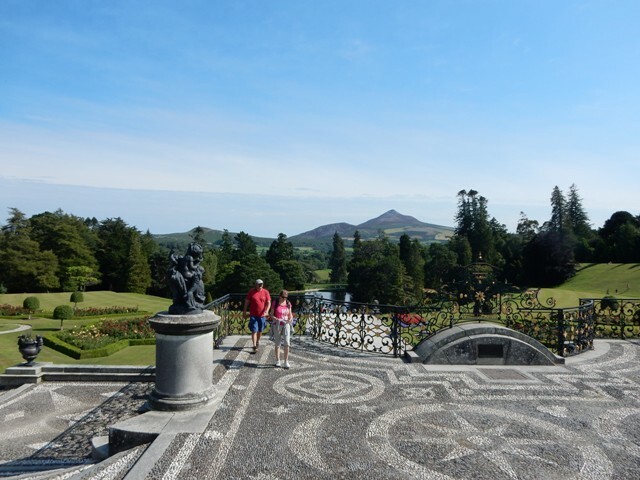 The River Walk along the Dargle, through Powerscourt gardens brought back school day lines from Thomas Moore: “T here is not in this wide world a valley so sweet as that vale in whose bosom the bright waters meet”. 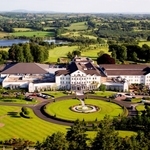 Powerscourt Hotel, just south of the Co Wicklow village of Enniskerry Co Wicklow is a 30 minute drive from Dublin city. It’s also marketed as the Marriott Autograph collection. Mid week deals that include dinner from €300 per person, including a two night luxury escape with one dinner depending on time of year. Nightly superior (standard) rooms at €157 online. City Jet operate several flights daily from London City airport to Dublin and are launching new routes into Cork from October 1 are offering special accommodation-flight deals with Powerscourt Hotel.